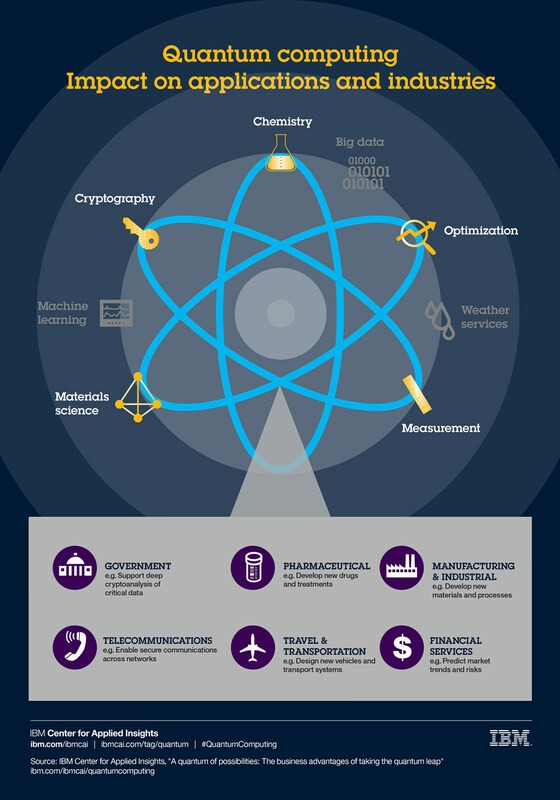 What is Quantum Computing & Why Is It Important? By Preethi Ranjit in Desktop. Updated on April 28, 2016 . The concept of "Quantum Computing" recently going viral – thanks to a certain Prime Minister – is one of the many uncharted territories of science by us non-scientific peeps. The reason most of us haven’t heard of it yet in spite of it being around for decades, is that for the most part it’s theoretical and those who were experimenting on it at the beginning were very hush-hush about it due to the need for military and corporate secrecy. Nonetheless, we now know that a quantum mechanics and computing combination exists and suddenly this is inside everybody’s scope of interest. If you don’t know what a quantum computer but don’t want to be left out of the loop, read on to find out why it is better than the traditional computers we work with today. Computers are mostly digital-electronic and will interact with data represented in binary digits known as bits (0’s and 1’s). Be it images, text, audio or any other data – it’s all stored in bits. Physically, the binary numbers 0 and 1 can be represented using any two-state entity like a coin (head and tail) or a switch (on or off). In computers, bits are the presence or absence of voltage (1 or 0), or change or preservation of magnetic direction in magnetic hard disks. Data is manipulated by computing the stored bits. Computation is done by logic gates which are typically made up of transistors that control the passage of electronic signal. If it allows the signal to pass through, it’s the bit 1 and if the signal is cut off, it’s 0. With the ever-shrinking chip size and growing number of components, electronic devices can come with millions of transistors that can be as small as 7nm (which is 1000 times smaller than a red blood cell and only 20 times larger than some atoms). The size of transistors can continue to shrink but eventually, they’ll hit a physical limit where electrons will just tunnel through them and there’ll be no control over the electronic signal flow. For the ever growing need of powerful computation and smaller devices, a size limit on a basic electronic component is a progress curb. Scientists are looking for new ways that take less time and space to compute and store data, and one of the ways we can use is quantum computing. Quantum computing uses qubits instead of bits to represent data. 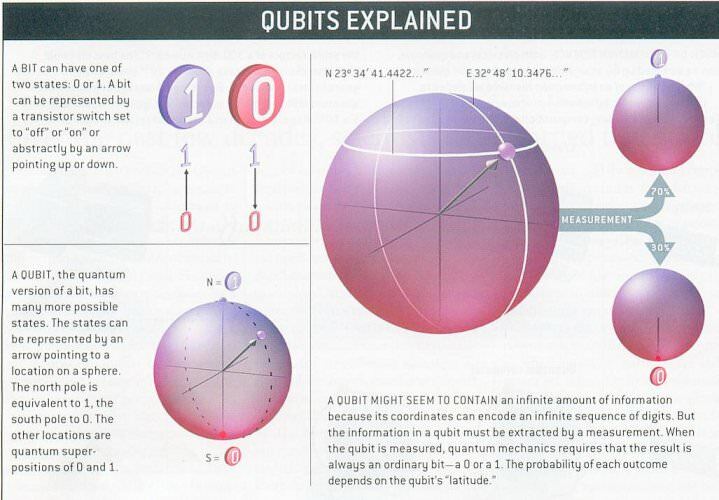 Qubits are represented using quantum particles like electrons and photons. Quantum particles possess properties like spin and polarization which can be used to represent data. For example, a qubit spinning upward can be 1 and downward 0. But the power of quantum computing comes from the fact that unlike bits which are either 1 or 0, qubits can be 1 and 0 simultaneously, because of a property called superposition, where quantum particles are in multiple states at the same time. This increases the computation power of qubit, since it can be used for both 1 and 0 during computation and at the end, once measured, it becomes either 1 or 0. The superposition property can be easily explained by a famous thought experiment done on an imaginary cat by Schrödinger, an Austrian physicist. In the quantum world, there is also another property that can be exploited in computing quantum entanglement. It basically refers to quantum particles’ properties that get entangled and become dependent on each other and thus cannot be changed separately. They act like a single system with an overall state. Let’s say 2 qubits undergo entanglement, if one of the qubit’s state is changed, the other will change too. This leads to real parallel processing or computing that can cut the computing time significantly compared to traditional computers. There are many practical hurdles to be overcome by the scientists and engineers, like creating a controlled environment for the qubits and finding ways to manipulate their properties, to produce a desired outcome. But once quantum computers with high computational power are finally created, they can be used to solve problems that would otherwise take a very long time to be completed by traditional computers. Finding prime factors of large numbers, the traveling salesman problem for a large number of cities, and other similar problems require an exponential number of comparisons to get results. Also, searching through colossal databases is still a very time-consuming process for even current digital computers. These issues can be addressed with quantum computers, which can solve problems that can take centuries in traditional computers, in a matter of minutes.